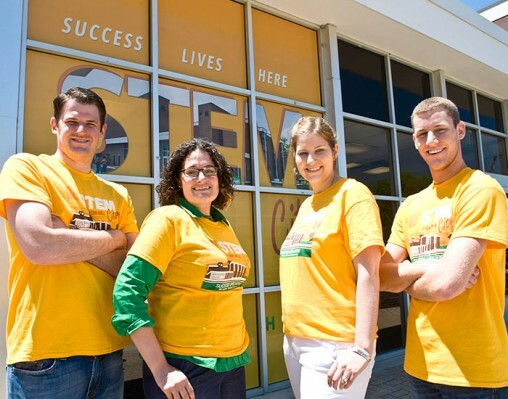 (From left) Jonathan Bullock, graduate student intern; Jennifer Papadakis, STEM City program director; Jennifer Attenweiler, assistant director, Residence Life; Colton Metzger, graduate student intern and STEM City program coordinator. When you live together, you learn together. This is the slogan that prompted the construction of Wright State’s newest micro metropolis, STEM City. Located in Hamilton Hall, STEM City is Wright State’s first residential learning community exclusively serving students enrolled in the College of Science and Mathematics (COSM) and the College of Engineering and Computer Science (CECS). STEM City gives its residents more opportunities for collaboration, nurtures interest in their discipline and provides access to academic resources. Residential learning communities like STEM City are becoming a popular trend among universities all over the country. They have been proven effective to get students involved in their discipline—as they collaborate with their peers, grades go up. “They’re the new wave,” said Jennifer Papadakis, an academic advisor for COSM and founder of STEM City. By coordinating the efforts between COSM, CECS and Residence Services, Papadakis laid the city’s first building blocks just six short months ago. Now, over the summer months, hundreds of students are laying claim to their piece of the pie—350 students are projected to live in STEM City during the 2014–15 academic year. STEM City is expected to be the home of 350 students during the 2014–15 academic year. “We want STEM City residents to forge relationships with faculty members, get into undergraduate research earlier and most importantly, connect with the community that will help and support them throughout their time at Wright State,” said Papadakis. STEM City is expected to boost GPAs, expand social circles, create faculty-to-student connections and keep its residents interested in the sciences, Papadakis said. Because of this fortified support system, STEM City’s residents are projected to fare better in academics than the most recent COSM and CECS residential class. Papadakis and other STEM City coordinators will pay close attention to the GPAs and retention rates of 60 randomly selected students. By tracking these students’ success rates, coordinators can figure out what works and what doesn’t. 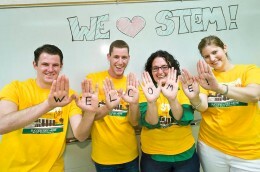 The dream is to make STEM City the number one place at Wright State for students of all academic standings to find a community that instantly makes them feel like an engineer, scientist or mathematician. With such a tightly knit group of innovative students, Papadakis said that anything is possible. To learn more about Wright State’s residential life, contact campus housing at (937) 775-3333. If you’re interested in the STEM City initiative, contact Jennifer Papadakis at jennifer.papadakis@wright.edu.